When it’s time for the three R’s—rest, relaxation, and romance—head to the heart of wine country and a small luxury resort in Healdsburg, California. Honor Mansion, nestled among the rolling hills of wine-producing Sonoma Valley, has just been named the Best Hotel for Service as well as the Best Hotel for Romance in the United States by 2011 Traveler Choice Awards at TripAdvisor. Within minutes of our arrival, owner Cathi Fowler greeted my husband and me by name, and our every need was attended to from that moment on. Honor Mansion provides amenities and grounds comparable to much larger resorts (only 13 accommodations are available), yet it retains the size, intimacy, and personal attention that have built its reputation. Attention to detail, exquisite décor, and impeccable service have earned it four stars from AAA. When we entered our suite, lavishly decorated in deep red and gold, we began to understand why the inn has also been named among the Top 10 Most Romantic Inns by American Historic Inns, Inc. If you’re looking for a Valentine’s Day retreat, Honor Mansion provides the perfect balance of pampering and privacy. Amenities include European linens layered over pillow top beds, Egyptian cotton towels, imported toiletries, and a personal selection of movies to watch in your room—not to mention morning coffee or tea service delivered to your door according to your specifications. Privacy (our suite overlooked the nearby vineyard and had its own sun deck with spa) and superior hospitality make Honor Mansion a perfect destination for couples on a first—or second–honeymoon. 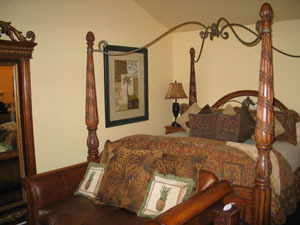 Each guest room has a distinct personality and decorative scheme (examples: Rose Room, Angel Oak Room, Tower Suite (remodeled water tower), and four Vineyard Suites). My favorite feature was the double-sided fireplace; with a flick of the switch, flames danced in front of the large soaking tub in the bathroom and the adjoining bedroom. 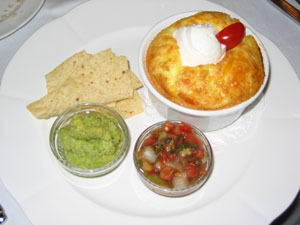 Breakfast at Honor Mansion was a celebration of gourmet dishes from recipes developed by Cathi and prepared by the on-site chef. Grand Marnier French toast followed grilled pineapple with mango sherbet one day; on another, eggs Benedict and blackberry cobbler reminded us to just savor flavors and forget about calories. Freshly baked cookies were always available, with complimentary local wines and appetizers served every afternoon. The resort itself is a visual pleasure, with four-acre grounds just made for wandering. 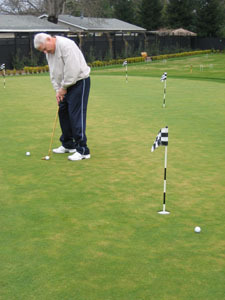 On-site activities include the PGA-designed putting green and a tennis court. Basketball, bocce ball, croquet, swimming pool, and a jogging track provide plenty of opportunities for exercise. We relaxed by fountains, found secret sitting spots, and admired the classic rose garden, koi pond, and 100-year-old magnolia tree that shades the front lawn. This Victorian-style mansion is named for its most famous owner, Dr. Herbert Honor, whose family owned the house for more than a century. Totally restored by Steve and Cathi Fowler, who bought it in 1994, the property has been transformed into an elegant resort at the gateway to Sonoma wine country.During our stay, we visited several family-run wineries in the Dry Creek, Alexander and Russian River Valleys. Less crowded and commercial than Napa, picturesque northern California is one of the premier grape-growing regions in the world. 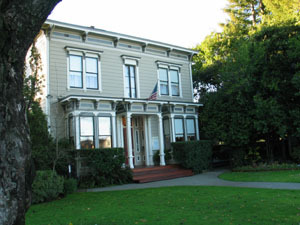 Area attractions: Boating, fishing, hiking, and picnicking at Lake Sonoma; Wine Country jeep or bicycle tours; numerous tasting rooms and wineries; Healdsburg Museum, farmers’ market, antiques stores, and galleries; Windsor Golf Club; hot air ballooning. Note: As is common in the travel industry, complimentary services were provided for review purposes. While it has not influenced this review, StripedPot.com believes in full disclosure of all potential conflicts of interest.